Autograph is designed to make it simple to slap your signature on just about anything. If you're having trouble doing that, we can probably help. The information on this page is reasonably up to date, but if you need more information, let us know using info@tenonedesign.com. How can I sign a .pdf document using Autograph? Export the pdf into .tiff format. Open it, fire up Autograph, and drop in a signature. It usually shows up in the bottom left corner of the page. Be careful where you place it because preview does not allow editing later. You can now export the document page back into .pdf format. Note the document will now be a raster format and no longer searchable, similar to if you had printed and scanned it. Drag in the signature page of your PDF into a new Word document. Then, fire up Autograph to drop in a signature. Be sure to change the image wrapping to "in front of text" in Word after your signature appears. Then you can position it correctly. In Autograph, go to preferences and check save to desktop and select PNG format. In the PDF in Acrobat, select the TouchUp Object Tool (Tools - Advanced Editing), right click on a blank space, and select "Place Image." Navigate to desktop, choose PNG as type of image, choose your image, "autograph.png." PDFPen just works. It's an intuitive experience, with no surprises. Highly recommended. For multipage PDFs, click on the page where you want the signature in the main view before launching Autograph. How can I integrate with FileMaker for a paperless office? You'll need a button to trigger the Autograph window, and a container field to hold the autograph.png file. Make sure to configure Autograph to save an autograph.png file to your deskotop. 1. Create the Container field on the layout (here I named it gContainer1 and its a global container for my purposes, but you can use whatever you wish). 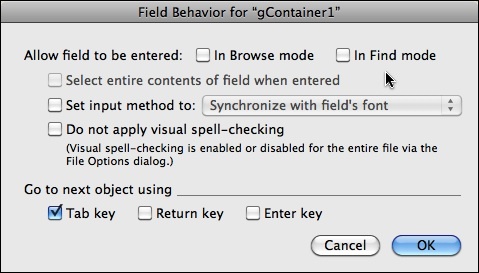 The behavior for that container field should have 'Allow field to be entered:' with 'In Browse mode' unchecked. 2. 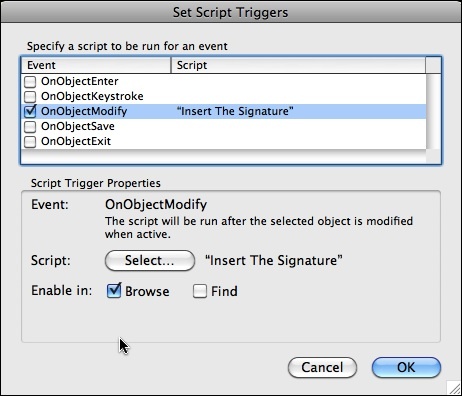 Create a trigger script which I call 'Insert The Signature' with the following script steps. 3. Set the script trigger for the Container field to 'OnObjectModify' as shown here. 4. Create a button to trigger Autograph. The FileMaker script is as follows (the actual name of the container field depends on your database of course). Perform AppleScript["tell application "System Events"
Now, in browse mode, click on the button, the Autograph window comes up and the container field is entered. When you sign then hit the Enter key, the container field is modified and then picks up the autograph.png file and the correct background is then there. A big thank you to Ron Smith MD for these integration instructions. How can I insert a signature into GMail web interface? First, you must enable inline images in GMail. Read all about that here. After that's settled, you'll see a picture icon in the toolbar when you start to compose an email. Make sure Autograph is configured to save to your desktop, and make sure PNG format is selected. Click the image icon in GMail, and choose the new image on your desktop, Autograph.png. First, make sure your computer is compatible. If you haven't already seen it, the compatibility information is here. Also, make sure your program is compatible, and is not configured for plain text only. Another good idea is to reset Autograph preferences from the General Preferences pane. 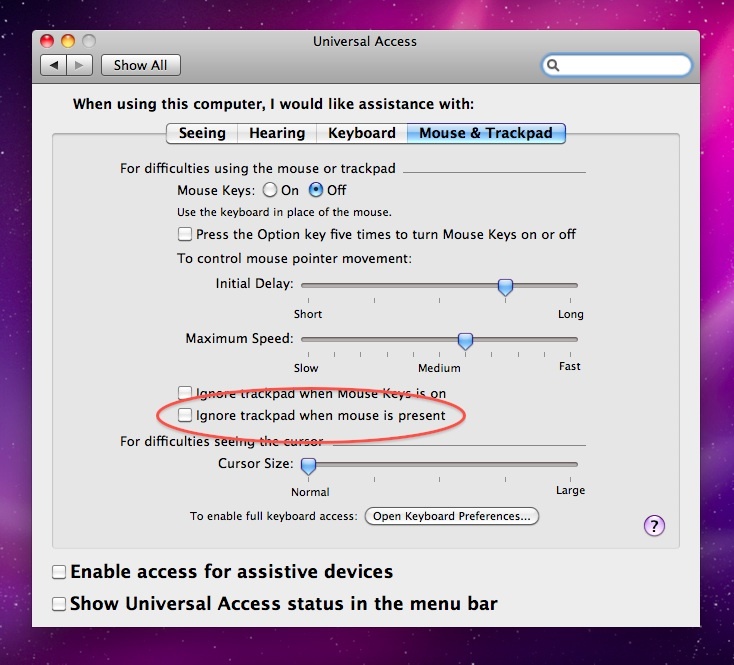 Lastly, make sure your trackpad isn't disabled. You can change that here. Any Suggestions for MS Word? It's often helpful to change the image wrapping to "in front of text" in Word after your signature appears. Then you can position it correctly, and sometimes it keeps the signature from showing up white instead of black. Will the signature stand up in court? We do not claim any legal consequence of electronically signing a document by using Autograph. We feel the signature capture function of Autograph provides good Signer Authentication (i.e. it is difficult for another person to reproduce), but it does not attempt to authenticate the document being signed. For example, a signature could be inserted into a PDF document, and the document could be later revised while retaining the signature. For legal purposes, we recommend using a digital asymmetrical key encryption system to generate a hash result that will guarantee the document has not been altered. This should satisfy nearly any legal requirement.